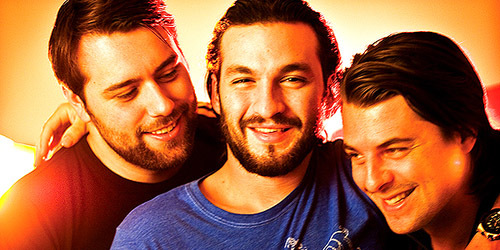 Swedish House Mafia finally have their first big hit in the States as “Don’t You Worry Child”, featuring vocalist John Martin, sits at #7 on the Billboard Hot 100 this week. Though this may be the only time the group charts together (they’re currently on a farewell tour), they’ve it done with a song that becomes the first top ten title since the 90’s to feature the word “child” in it. In total, 59 song titles with the word “child” (or some variation like “children”) in them have made the Hot 100 since it began in 1958, 27 of those making the top 40. The first of them, in early 1959, was “The Children’s Marching Song (Nick Nack Paddy Whack)” by Cyril Stapleton and His Orchestra, which was quickly followed by a version from Mitch Miller and his “Sing Along With Mitch” Chorus. The Stapleton version rose to #13 and the Miller version got to #16. This English band came to the States as a part of the British Invasion in 1964 and launched four songs into the top 40, this one being the biggest. After two additional Hot 100 singles in 1965, the group experienced several membership changes and ultimately folded several years later. They’ve reunited since, but haven’t charted again. Girl groups don’t come bigger than this. In just about five years, they accumulated twelve #1 singles on the Hot 100, this two-week topper being the eleventh of them. Ross departed the group roughly a year after this single and they had several years of top-40 hits without her, including two top tens. Ross, of course, did quite a bit better, with six additional #1 hits on her own. Dance group Sweet Sensation took their version onto the charts in 1990, just missing the top ten with a peak of #13. Another of Motown’s biggest acts makes the list with this single, which also spent two weeks at #1 on the R&B chart in March. All five members sang lead on the song. The quintet scored Hot 100 and R&B hits for several decades to come, including songs like the #1 “Papa Was A Rollin’ Stone”. After years of top-40 misses, this song from the Chicago group featuring the Burke siblings cracked the top ten during the summertime. They made the Hot 100 several other times after this song hit, but nothing placed within the top 40. A remake by Dino in 1993 hit the top ten in CHR airplay, but managed a lower #27 on the Hot 100. One other cover, done by Daryl Hall and John Oates, became a minor adult contemporary hit in 2005. After his partnership with Art Garfunkel dissolved in 1970, Simon began his string of solo successes with this first hit, which also made the top 5 in countries like Australia, Canada and the United Kingdom. Simon would soon eclipse this solo peak with bigger entries like his only #1, 1976’s “50 Ways To Leave Your Lover”. English-born, Canadian-raised Gilder only made the top-40 once in the States with this #1 hit. He scored several other big singles in Canada, including a #1 with his former group Sweeney Todd, “Roxy Roller”, in 1976. Axl Rose and the boys garnered their first and only chart-topper with their first single to make the Hot 100, spending two weeks at #1 in September. The Los Angeles band took five other songs into the top ten through 1992. Their long-awaited Chinese Democracy album was finally released in 2008 and they were inducted into the Rock and Roll Hall Of Fame just last year. This ballad was the second and final top-40 hit for this rock band from Denmark, placing just behind songs from Paula Abdul and Sheriff. The first, “Wait”, hit the top ten the previous year. They continued to make the Billboard 200 album chart in the U.S. until 1991. In 1989, one of the biggest bands out of Boston managed to place six songs in the top 40, all within that one chart year. This was the last of them, from the album Merry, Merry Christmas, and appropriately peaked during the week of Christmas. NKOTB managed two other top ten hits after this, then broke up in 1994 and experienced a successful reunion in 2008. They release a new studio album, 10, in April. From his album Older, the single marked a major comeback for Michael, his first top ten hit in four years on the Hot 100. Followup single “Fastlove” would be his last single to make the Hot 100, peaking at #8, though he’s had a top-40 single in the United Kingdom as recent as last year. For the young at heart and on the charts, make sure to click the follow button to get updates from POP! Goes The Charts and follow me on Twitter: @AdamFSoybel.